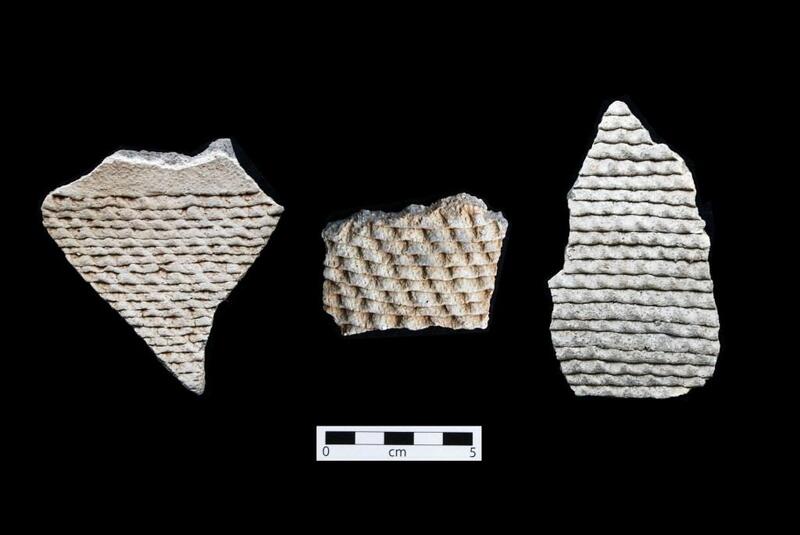 Tusayan Corrugated sherds. Click the image to open the Tusayan Corrugated gallery. Tusayan Corrugated is one of the most common types of Tusayan Gray Ware, with a geographical range including northeastern Arizona, northwestern New Mexico, and southern Utah. Date Range: Kayenta Heartland: A.D. 1020-1210 (Christenson 1994), Flagstaff Area: A.D. 1050-1275 (per Christian Downum, Northern Arizona University). Core Color: Light gray to dark gray; sometimes almost black. Temper: Abundant moderately coarse quartz sand; temper fairly conspicuous on both surfaces. Surface Finish: Rough; interiors scraped; exteriors usually moderately well-smoothed. Not polished; coils unobliterated on exterior surfaces; usually deeply finger indented in fairly regular and carefully executed pattern; many minor variations; occasionally series of contiguous non-indented coils; width of coils and depth and size of indentations vary widely; coils from about 3 to 8 mm in width; coils cover all or nearly all of exterior surfaces. Forms: Jars, bowls, and jugs. Vessel Thickness: 3.8 to 7.1 mm; average 5 mm. Decoration: No painted decoration; clapboard corrugation, indented corrugation, occasional appliqué over corrugation. Other Names: Corrugated Ware, Gray Corrugated, Deadmans Corrugated.